We strive to have all our green initiatives student-led. It is the young minds at ÉBEYS who provide us with the greatest guidance moving forward. Being recognized by the provincial government as a Transformational Level Eco Globe School has also been an honour for everyone in our school. In our first year of Battery Recycling, we entered and won the Call2Recycle Battery Blitz Recycling Challenge. In two weeks, the school was able to collect approximately 11,000 batteries weighing just over 600 pounds! In the process, the students learned how these collected batteries would be safely recycled rather than ending up in our landfills. Due to the success of the challenge we have continued with the program. With the support of our Parent Advisory Committee, we were able to raise the funds required to have a dedicated water bottle refilling station installed next to our gymnasium. Rather than relying on single-use bottled water, the students can refill their own personal containers throughout the school year. The station even includes a bottle counter, which tracks the number of plastic single-use containers that are being saved. Like many other schools throughout Manitoba, we have a recycling program. We are part of the Recycle Everywhere initiative. 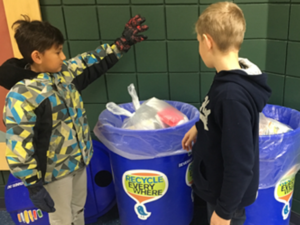 The classrooms in our school have blue bins for collecting items such as scrap paper, cardboard, empty boxes, plastic drink bottles, pop cans, juice boxes, yogurt cups, fruit cups and milk cartons. At different times throughout the school year, students and staff also have the opportunity to compost. With five composters on our school grounds, students have learned how certain food leftovers can be converted into nutrient-rich soil for the school garden boxes. Through generous grants from Tree Canada, the Province of Manitoba and the fundraising support of our Parent Advisory Committee, we have been able to add over 30 new trees to our school's green space. This has provided students with many new opportunities, across numerous subject areas, to study and learn about the natural world around them. Ahki is an Aboriginal Cultural Awareness group that started 10 years ago at Ecole Beausejour Early Years School. Ahki in Ojibway, when translated to English, means “Mother Earth”. Students and staff sharing circle leaders meet monthly, throughout the school year, to engage in aboriginal storytelling/legends followed by talking circles. Each year, around the holidays, the group meets throughout the school day to learn about the history, importance and use of a particular item in the aboriginal culture. Students then get to do a craft to take home. This year the Ahki students made hand drums, which they learned represents our heartbeat and is our main source of life. They also learned the drum can be a self-calming tool used to get in touch with ourselves and our heartbeat, as well as being used in times of celebration. In spring, the students participate in a Spring Bannock Celebration, where students sample fresh- out-of-the-oven bannock, many for the first time. Whether it be with butter or spiced up with jam or honey, it is delicious either way. Grade 5 Ahki students get a special treat in May when they head to Sandy Saulteaux Centre for the day to learn how to prepare for and partake in a traditional sweat lodge with an elder and firekeeper. It is a great way to end the year. Ahki is open to all students in grades 1-5 at our school and 53% of students are members of Ahki. This educational group continues to grow, with students of all different cultural backgrounds and knowledge levels. We currently have 160 students who are part of Ahki. Meegwetch to you all. Students at École Beausejour Early Years School are practicing good digital citizenship when engaging with technology. Students are learning about cyber safety, acquiring information and communications technology (ICT) skills, practicing good “netiquette” and learning how to refuse and report cyberbullying. Students are also becoming creators of technology through coding. Research has shown that coding improves creativity, collaboration, problem-solving, communication and perseverance and is quickly becoming an essential skill of the future. A majority of grade 3, 4 and 5 students have participated in the “Hour of Code”. Several classrooms are integrating robotics across curricular areas through the use of mini-Spheros.